One of the most distinctive regional styles of Panama is that of the Conte group. 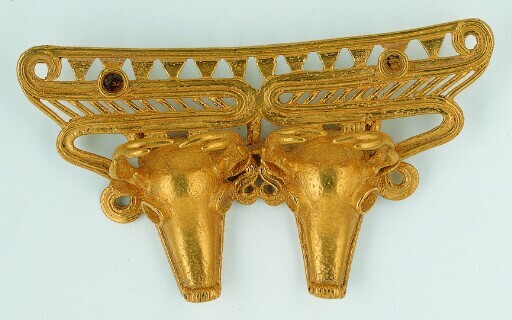 In the Two Deer Heads pendant, what may initially appear as merely decorative elaboration above the deer heads is in fact an artful stylization—a pair of outward-facing profile heads of an important deity, a crested saurian. The long, many-toothed snout of the crocodile is topped by a notched “crest” that alludes to the skin texture of the crocodile and other lizards. The eyes of all four heads were once inset with bone, amber, or hardstone. The pendant may have had a talismanic function, invoking saurian or other animal spirits that were believed to have a special protective relationship to the wearer.